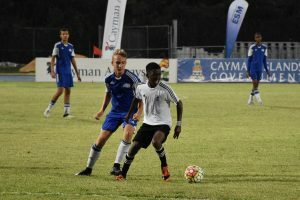 GEORGE TOWN, Grand Cayman – Tottenham Hotspur and Cavalier Soccer Club both recorded their third consecutive victories in the Cayman Airways U-14 Invitational Youth Cup on Thursday. In doing so, both teams finished atop their respective groups and advanced to the semi-finals to be played on Friday at the Ed Bush Stadium in West Bay. Also making it through to the semis are Harbour View FC and Gillingham FC. Harbour View’s Kafui Doouet (yellow) tries to maintain possession away from Tottenham’s Rio Campbell. The match that would determine the winner of Group A got off to a flying start with English side Tottenham jumping in front with the early lead thanks to a 1st minute goal from Noni Madueke. Jamaica’s Harbour View would not be deterred, as Oquassa Chong scored from a free kick minutes later. Harbour View took control of much of the first half possession and was inches from taking the lead, when Ronaldo Robinson beat Joshua Oluwayemi in the Tottenham goal but the ball ricocheted off the post and back into play. With the score level entering the second half, both teams sought the advantage, which went in favour of Tottenham when Tarrelle Whittaker put one past Harbour View keeper Recardo Laing. Spurs lead was extended after an unfortunate attempt by Harbour View defender Shacqkeil Campell to clear the ball from inside the box resulted in an own goal. Chong added another to cut the deficit to one goal with seven minutes left in regulation. Substitute Matthew Bell missed a chance to equalise shortly before the final whistle. Tottenham’s win maintained their position at the top of Group A with nine points from their three wins in group play, while Harbour View held on to second place for a spot in the semi-finals. Jamaica’s Cavalier SC held off Cayman’s Academy SC on the last day of group play. Cavalier SC was aggressive from the opening whistle with an attempt on the opening possession but the shot from the boot of forward Shanthamoi Brown sailed over the crossbar. 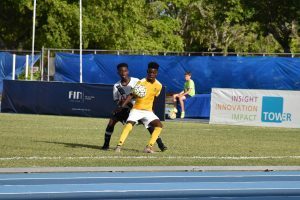 Cayman side Academy was granted the early lead due to a Cavalier SC own goal in the 2nd minute – the only goal scored against the Jamaican side in group play was self-inflicted. However, Cavalier needed only a minute to ensure they would not trail when Brown found the back of the net. After an interruption due to the threat of lightning in the area, play resumed with intermittent rain falling. Brown once again scored in the 26th minute to put his side ahead, a lead they would not surrender. Dwayne Attkinson added another tally in the 42nd minute before Brown recorded his second hat-trick of the tournament in the 53rd minute. Rojeaux Baines padded the lead on a breakaway 11 minutes later. Cavalier SC’s third win in as many games ensured they advance to the semi-finals as the winner of Group B with nine points. Needing a win to secure a semi-final berth, Gillingham put themselves ahead when Josh Regan scored on a breakaway in the 10th minute, the first of three Gillingham goals in three minutes. The other two came from Grant Odejeh, who completed his hat-trick in the 16th minute to give the English side a 4-0 lead. IFFDC was playing their best match of the tournament despite the big lead for Gillingham. The side from Dallas was rewarded for its improved form when Patrick Koffi put one past Joe Walsh in the 26th. A minute later Harry Laing, who replaced Odejeh up front, added a fifth for Gillingham. Despite trailing 5-1 at the break, IFFDC players did not give up. Louis Sloane scored for the second time in the tournament to cut the lead to three. Gillingham were quick to reply with Jay Hards entering his name onto the scorecard. Alexander Brown scored for IFFDC in added time to bring his side back within three but it was ‘too little, too late’. Gillingham’s win leapfrogged them of Academy SC into second place in the Group B table for a spot in the last four. The first consolation game kicks off at 3:30 p.m. between the two fourth place finishers – Sunset FC (Cayman) and IFFDC (Dallas). The second consolation game, scheduled for 4:45 p.m., features the two third place finishers – REV Soccer Club (Minnesota) and Academy Sports Club (Cayman). Tottenham Hotspur, which topped Group A will face Gillingham FC, the Group B runners-up, in an all-England affair at 6:30 p.m. Cavalier Soccer Club and Harbour View FC, two of Jamaica’s top youth sides will play each other in the other semi-final at 8:15 p.m.